Gargur, No'maan, Melsoon and Shams — four of the Muppet stars of Iftah Ya Simsim, the first Arabic-language version of Sesame Street. 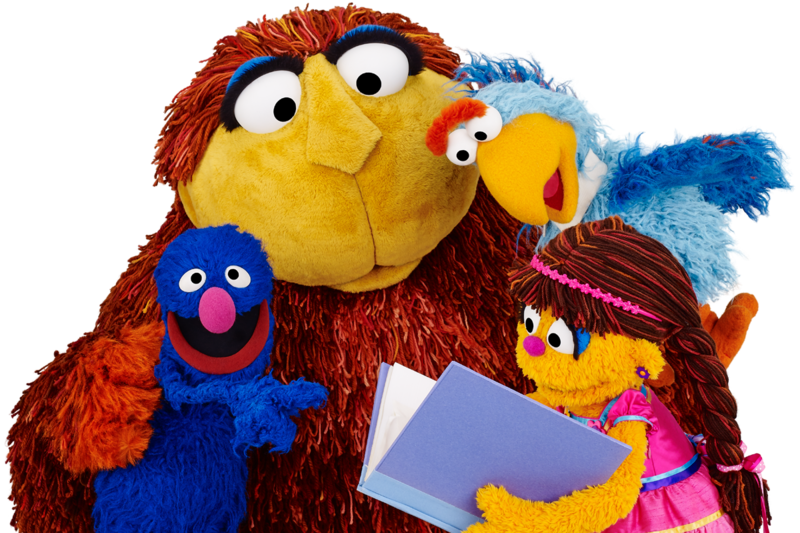 The show went off the air 25 years ago, and other Arabic-language Sesame Street spinoffs have launched since — but now, the original is debuting again. Iftah Ya Simsim, the Arabic-language version of Sesame Street, has re-debuted in the Middle East after a 25-year hiatus. Cairo Arafat remembers watching the show with her younger siblings back in the 1980s. "If you were in Morocco, or in Egypt, or in Syria, and in all the countries throughout the Middle East, children were able to watch the show weekly, or even daily, as the show began to progress season after season," she explains. When it launched in 1979, Iftah Ya Simsim ("Open Sesame") was one of the earliest foreign language spinoffs of Sesame Street — and the first Arabic-language version. But the show's studio in Kuwait City was partially destroyed by fighting from the Gulf War, and Iftah Ya Simsim went off the air. It stayed dark even as the Gulf War came to an end, and Western television shows took off. Over the years, new shows came out that were popular with kids — but often they were Western programs, dubbed into Arabic or just subtitled. "Ten years ago there started to be a movement within the region as people began to ask, 'Well, what's happening to Arabic?' " Arafat says. "There's been a really great emphasis on ensuring that our children can speak proper Arabic." Nostalgia probably had a role too: many of the kids who grew up watching and learning Arabic from Iftah Ya Simsim are parents themselves. It was clear to Cairo Arafat and others that the time was right for Iftah Ya Simsim to return. Her production company, Bidaya Media, is producing the new version from Abu Dhabi. The first episode premiered on Friday on ten stations around the Middle East and North Africa, and segments are being released on the show's Youtube channel. Its opening is similar — the same theme song, still children playing — but now it's shot in high definition. But in the premiere, a sand storm has just hit, and the place is a dusty mess. The Muppet Gargur — or as Western audiences may know him, Grover — comes to help the children clean, and everyone learns a lesson about recycling. There are plenty of elements unique to Iftah, including its two local human stars and No'maan, the huge friendly camel that lumbers around the set. But American viewers would see a lot that they recognize. There's Elmo, Ernie and Bert — and a Cookie Monster who doesn't love cookies, but biscuits. "He loves the date biscuits," Arafat explains. "Dates are common here, so he's into the date biscuits." She says that the differences between the two shows aren't what's important. "Children are curious. They want to feel loved," she says. "They want to learn new things. They want to see funny things. They love music. "I think those are the things that unify children across all countries," she says.